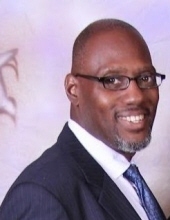 Apostle Nate Lamont Pritchard, 51 of York transitioned on Friday, February 1, 2019. Nate was the loving husband of Stephanie (Gelzer) Pritchard. Nate was born on February 20, 1967 in York to Paulette V. Pritchard and Pastor Leighton McMillan, Sr. and was raised by his father and Dr. Deborah (Kittrell) McMillan. Nate was a high school graduate Class of 1985 of Asheboro, NC. He continued his education in York at Yorktowne Business Institute with a degree in Culinary Arts. Nate is the Apostle of New Perspective Community Church, where he teaches the truth of the Word of God. Nate started his spiritual growth at Emmanuel COGIC under the leadership of the late Elder Walter W. Wise; after marrying Stephanie he became a member of Fairview FGMB Church under the leadership of Overseer Robert J. Jamison and then Family Life Ministries, Intl. under the leadership of Drs. Wendell B. & Juanita Burden. Nate enjoys cooking, making people smile and laugh, reading, painting, making jewelry, sharing the Word of God, and loving his family, especially spending time with his grandchildren. Nate also loved helping people and he enjoyed working for Jessica & Friends as well as Senior Helpers. In addition to his parents, Missionary Paulette, Pastor Leighton and Dr. Deborah; his loving and supportive wife Stephanie; Nate leaves to cherish his memory 3 sons Tyre Duncan, Donovan Pritchard and Jared Jones; a daughter LaTavia B’Williams husband Charles; 4 brothers Lanse Jackson, Leighton McMillan, Jr. wife April, Brandon McMillan wife Crystal and Jonathan K. McMillan; a sister Eyana A. McMillan; a brother-in-law Stefan A. Gelzer, Sr.; In-laws James Gelzer and Mary Riley; a god sister Ann Dorm; several god children; great friends Rev. Percy Powell, John Allen and Larry Thomas; his ex-wife Ms. Angelia Johnson; 7 grandchildren Sapphire, SaNiyah, Sylah, Octavius, Jr., Siyon, Chase and Sev’ynn; New Perspective Church family and a host of other family members and friends. Nate was preceded in death by his grandparents Horace & Emma McMillan, Victoria Pritchard, Rev. Irvin & Min. Margaret Kittrell and a sister Alicia Layton. Apostle Nate L. Pritchard will truly be missed. He exemplified his favorite scripture, Heb 12:14 Follow peace with all men, and holiness, without which no man shall see the Lord. To send flowers or a remembrance gift to the family of Nate L. Pritchard, please visit our Tribute Store. "Email Address" would like to share the life celebration of Nate L. Pritchard. Click on the "link" to go to share a favorite memory or leave a condolence message for the family.